Brighton Beer Garden: Right On, Beer Garden! The Brighton Beer Garden once spent an illustrious summer as one of our favorite Stump! Trivia haunts. 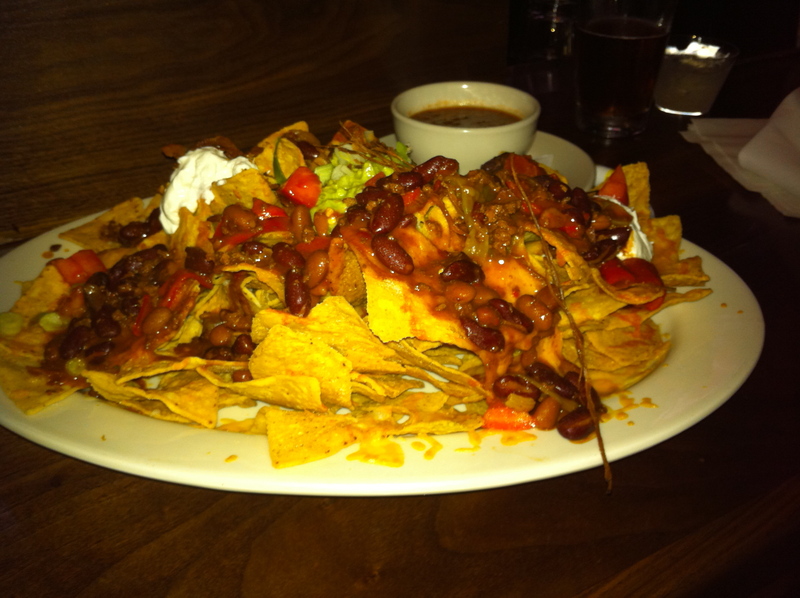 Yet somehow, each time Wednesday rolled around, we found ourselves avoiding the nachos. Extrapolating from the average-quality bar food making up the rest of the menu and the $14 price tag, we expected them to be mediocre, forgettable and overpriced, and so always managed to conveniently find something else on the menu that we wanted to order more. But lo and behold, a new menu has debuted, featuring items like bacon-wrapped scallops and lobster ravioli. Could this gentrification spread to the nachos? We were determined to find out. Appearance: (8) Our kidney beans runneth over, along with everything else! These presented a visual feast as they approached, with their wide variety of toppings. Significant naked chips left us worried, however. Quality of Ingredients: (8) It’s a testament to how pleasantly surprising these nachos were that it took a few minutes for us to realize that they had BACON on them. Bacon! Only a small smattering, but still, bacon! Our attention was primarily taken up by the Garnish of Delicious Mystery, which, after sending a bartender off to the kitchen to inquire about, we learned was thin threads of beef jerky. The chili was full of kidney beans, and the guacamole tasty enough, though Guacaholics Anonymous was still fresh enough in our minds to limit our intake to a few nibbles. Chips were nothing special. The salsa in the big cup off to the side was finely minced and deliciously fresh, a rare find indeed! Distribution of Toppings: (7) It’s hard to report on the naked chip situation because we didn’t make it through enough of these to have that be a problem. This was a sizeable plate of ‘chos and while we barely made a dent in it, the parts we did get to had a decent distribution. Even if a naked chip did arise, the guac and sour cream (not too cloying, fortunately) were there for the dipping, along with the delicious fresh salsa on the side. At first we wondered why the salsa was presented on its own, but in the end it made sense– it was so pureed, almost gazpacho-like in texture, that it would have turned everything soggy. We applaud the chef’s good sense in this situation.